About ten years ago (and I can't believe it's been that long), I had the opportunity to perform in Savior of the World at the LDS Conference Center Theater in Salt Lake. I had just moved back to Utah, and was starting out in a new place with a new job and trying to figure out how to start my life again. I spent a lot of time on Temple Square, writing in my journal and reading my scriptures and just trying to rebuild myself as I was coming off the rollercoaster ride of my mom's sudden death and my recent divorce. I call it my reconstruction period. *grin* During that time, one of the experiences I was most grateful for was a devotional that taught me the importance of General Conference. About two weeks before the April session of General Conference, our director David Warner gave the devotional. He talked about the preparation we had been putting into getting the show ready to perform, and then he talked about his office in the Church Administration Building. That for the last month, things were very quiet and reverent as our church leaders were preparing to speak to us at General Conference. That it was always this way the weeks leading up to Conference. And then he spoke of the temple grounds themselves. That if we looked around, we would see that flowers were being planted, things were being fixed and cleaned and prepared so that the buildings and grounds were as prepared as they could possibly be for General Conference. And then he looked at us and said, "What are you doing to prepare to hear the messages that have been so carefully prepared for you?" Never had a question cut me to the core so quickly as that one did. Growing up in Utah, General Conference was an important part of our family's life, but because it was on the radio and on TV, it wasn't something we stopped our lives for on Saturday to really pay attention to. It certainly wasn't something I would say I prepared for. But that day, everything changed. I prayed beforehand about specific questions I needed to have answered. I cleared my schedule to make sure I was able to watch every session of Conference live on television. And it was an amazing spiritual experience for me. Now that we have two small kids, I have to say that Conference isn't always the spiritual experience I'm craving. But, when I prepare and I have an open mind and heart, the messages cut through the crying and the toddler chatter. And I'm so grateful. And I was so inspired by Shannon's post about ideas for Conference traditions. We're going to try some new things with G-Man, and see what works. I want G-Man and L to look forward to Conference as a fun family tradition. Do you have any General Conference traditions? I'd love to hear more about them in the comments! 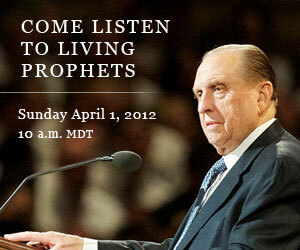 But mostly, I want to be prepared and ready for what the Lord's living prophets have to say to me. If you've never heard of our General Conference and would like to watch or learn more about it, please watch the video below and feel free to come to one of our meetinghouses or watch online at lds.org.